Ah, so you've got a brand new addition to your family. And it didn't come home in a typical way! That's right. When you were looking to expand your family, you just booked a flight to Isla Nublar to stop by Jurassic World. And that's where you visiting the laboratory of Dr. Henry Wu, the masterful dinosaur geneticist, and you had a little chat with him. Well, it wasn't long after that you returned home with something very, very special. A dinosaur egg. And now that egg has hatched, and you've got a mini little T-Rex! Okay, we realize that this is quite a fantastic story, but you can adopt it as your own narrative when you get this Jurassic World 2 Hatching T-Rex Costume for Infants. That's because we're gonna turn your kiddo into a baby T-Rex, freshly hatched! 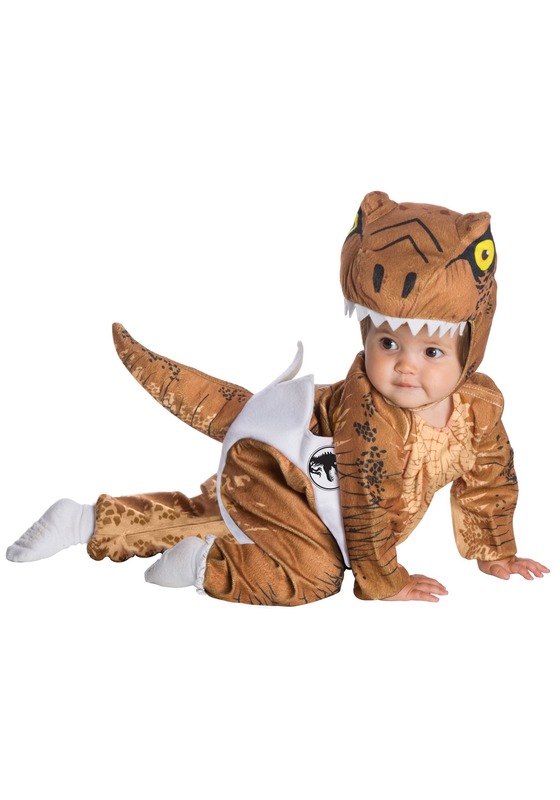 This Infant Jurassic World 2 Hatching T-Rex Costume is styled as a cute little jumpsuit. It's printed with a reptile print, design, and it has an attached "eggshell" section around the hips. It secures with a hook and loop fastener in the shoulder and in the inseam, has elastic bands at the wrists and ankles, and the tail is stuffable. It also comes with an oversized plush headpiece hood that features facial details. It's everything you need to get your little dino crawling! This costume is, of course, officially licensed from Jurassic World Fallen Kingdom. But it works great for any kind of Dinosaur fun! Ma and Pa could dress up as Claire and Owen with a dino baby when you dress your infant up in this costume. Or you could even dress as Dr. Alan Grant and Ellie Sattler carrying around a baby T-Rex! Get your whole family suited up with our costumes, and it's sure to be Jurassic sized fun!